.In 1949/1950 Que Que had a Jewish population of about 70 persons, about 21 families. I use the word, about, as some came and some went in the 50s. Also, some passed away. There is a link to the Jewish residents of Que Que further down this page. The best known families were the Slomans (Solly and Mottel ) who owned Sloman's Stores , the largest departmental store (and the only one, except for Que Que Stores which closed down in about 1953) in town. It sold just about everything, if you could find it; the store was in such a mess! Solly was a true philantropist, and he looked after all the down and outs of town, mainly gold smallworkers.His son-in-law, Mr Schmerel also worked in the store. Then there was Mr Rick, who owned a furniture shop and also sold bicycles; he passed away. Working for him as bookkeeper was old Mrs Bertha Haimowitz, whose husband died in about 1951. The only bakery in town was owned by the Phillipsons (their son is a Veterinarian who lives on Vancouver Island). The concession store on the Gaika mine was owned by Barney Kahn. Mrs Kahn ran the butchery, Barney imported Rhodesia's first Cadilac but he couldn't drive it at first. He got a licence for himself and Dora without being tested!! She only knew how to go forward, but couldn't back-up! Such was the life! The community had a tiny synagogue on Burma road, across the main railway line. They managed to hold services on most yomtavim, led by one of the locals. 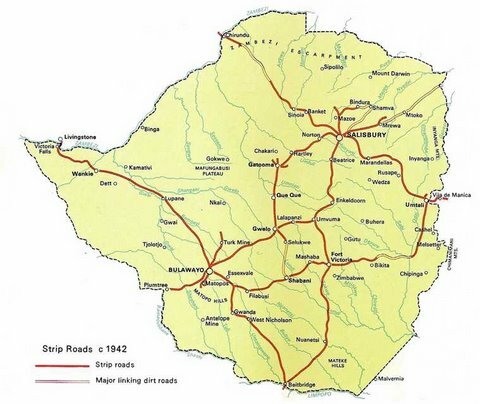 Kosher meat used to come from Bulawayo, with the train coming in at midnight. In the summer, the meat really stank! Google Map of Que Que Aaron and Morris Sloman have put together a Google map of Que showing businesses, homes, etc. Jewish Southern Afica SIG. The special interest group for researching Jewish Genealogy in Southern Africa. Que Que Cemetery Listing A listing of everyone in the Que Que Jewish cemetery with some tombstone pictures. Que Que Cemetery Re-Dedicaction 2004 speech by Peter Steinberg at the re-dedication ceremony. Once Called Home A Que Que blog by Diana Polisensky - daughter of Dr. Morris Hirsch. Many of her entries are about Jewish life in Que Que.